Welcome to German Shepherd Problems, I’ve set this website up to help with German Shepherd problems. Please feel free to check out some of the great resources and content I have on this topic. I will continue to update this site on German Shepherd problems so keep watching! As a German Shepherd owner, problems are a very real possibility, especially if the dog is not properly trained from a young age. Correct training is the key to resolving many German Shepherd problems. German Shepherd’s are very intelligent dogs and respond very well to training, so give your dog a great start by providing it with the correct training. To help with some German Shepherd problems, that may have already reared their ugly head. Listed below are some common issues and solutions. While the German Shepherd today is a very happy dog with superior intelligence and a loving personality when trained properly. 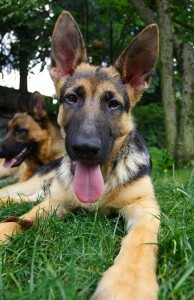 German Shepherd’s were originally bred for herding sheep and protecting flocks from predators. They have a high activity level and if they don’t have an outlet for this drive, they will get themselves into trouble (chasing cars, bikes, barking, chewing, aggression, digging and other destructive and unwanted behavior).This drive can be made worse when the dog is not properly socialized at a young age. They might grow easily agitated, over react to certain situations, and attack new animals or people in their homes. By no means is this is a common behavior, but it is a possible reaction and one that every German Shepherd owner should be aware of. To avoid German Shepherd problems due to aggression, socialize your puppy at a very young age, and then maintain a strong alpha presence in the household at all times. Show your German Shepherd puppy that you are in charge and that they need to defer to you for all responses. This will show them that they don’t need to be aggressive when you are home because you will deal with any issues that arise. Another side effect related to their high prey drive and high activity is to kill other animals that the German Shepherd sees as prey. This can extend to everything from moths and small animals like squirrels to the neighborhood’s cats. It’s a good idea to keep your dog always locked up when outside, and to make sure they meet your new cat at a young age. German Shepherd problems can become very serious issues if your dog starts to attack your neighbor’s animals. German Shepherds can easily grow agitated and start showing signs of extensive anxiety – especially if you give them too much attention when leaving or coming home. They are very people orientated and separation from their owners can cause them great distress. Not only will the dog bark when you’re away, they may begin to pace and show stress or depression. This is a major issue, and should be addressed early. For German Shepherd problems with anxiety, teach the dog from a young age not to seek attention before or after you leave or return home. Beyond separation anxiety, German Shepherds can grow neurotic over a number of issues – small sounds, digging, scratching, eating, or other common behaviors. It is usually easy to avoid this by keeping the dog busy and giving them a lot of exercise. A German Shepherd being an active dog requires a high level of exercise and needs at least 1-2 hours of exercise a day in some form or another. If you cannot spend time at home with your dog in the first 1-2 years of ownership, you should consider a different breed that does better spending time alone. Additionally, consider getting a second dog for company and spend at least 2-3 hours of every day in the company of your dog, no matter how busy you get. German Shepherd problems are similar to most dog problems, but can grow exponentially if you are not careful to nip them in the bud early. Spend time with your dog, address common aggressive tendencies and build a relationship early so that your dog remains healthy and happy for the duration of his life.